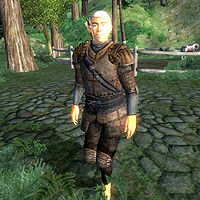 Torbal the Sufficient is a Nord hunter living in Brindle Home. Like the two other residents in the small settlement, Astante and Merildor, Torbal will point you in the direction of Melus Petilius' house should you need help in finding it. Torbal definitely believes in the principle of "early to bed, early to rise", since he sleeps in his house from 8pm until 2am. He will spend the rest of the day exploring the town and vicinities of Brindle Home. He carries a leather cuirass, greaves and shield for protection. In combat, he relies on a fine steel dagger, exactly one iron arrow and a leveled bow and set of arrows (both of which may be enchanted). He also carries a small amount of gold. This page was last modified on 20 October 2015, at 05:50.